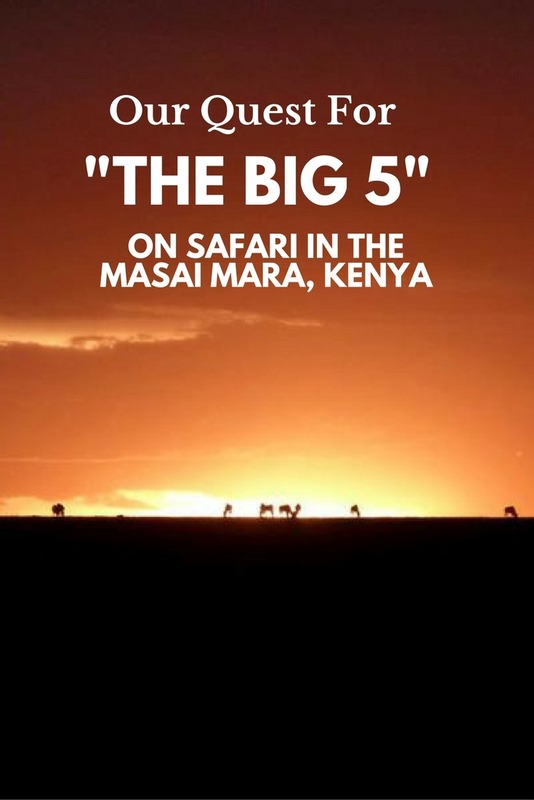 Budget Backpackers In The Masai Mara: Our Quest For "The Big 5"
When we were planning our budget Masai Mara safari in Kenya, the thought remained in the back of our heads that it was going to cost us a lot of money and we had already seen many of the African “Big 5” in South Africa. 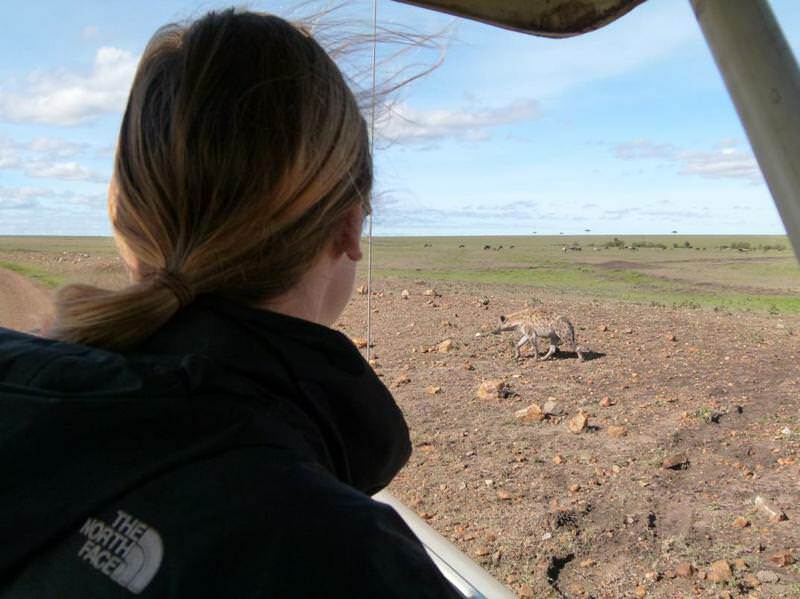 Was it worth it to do such an expensive safari just for the thrill of camping out in the reserve? 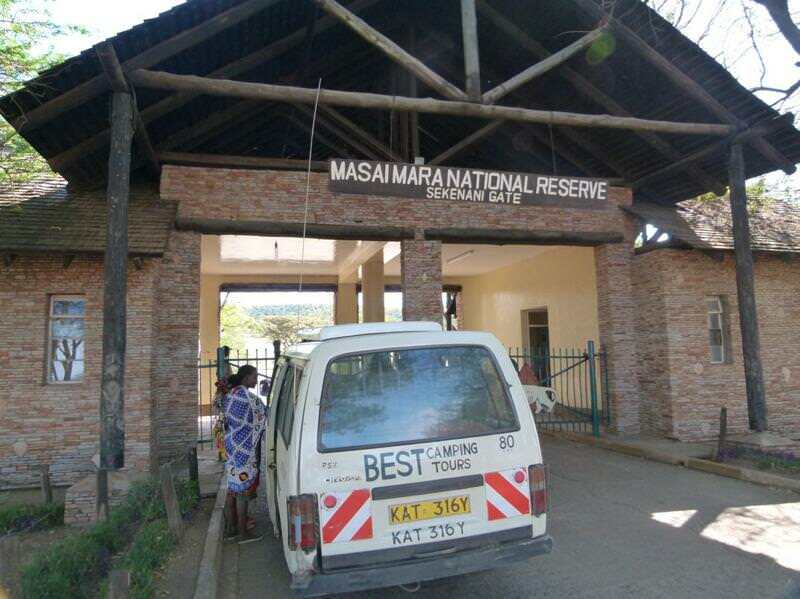 When we entered the gates to the great Masai Mara Game Reserve all those doubts were put to rest. 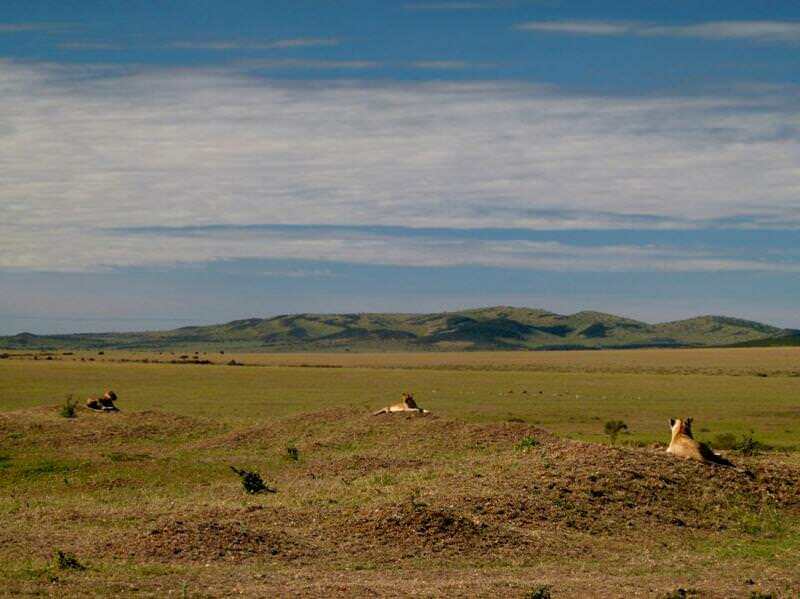 The sheer size of the great plains of the Rift Valley, and the indescribable density of the animals who graze, hunt and find sustenance in this fertile savanna, made it obvious that this was an entirely different African experience than we had ever had before. The low, rolling hills stretched on and on for as far as the eye can see. 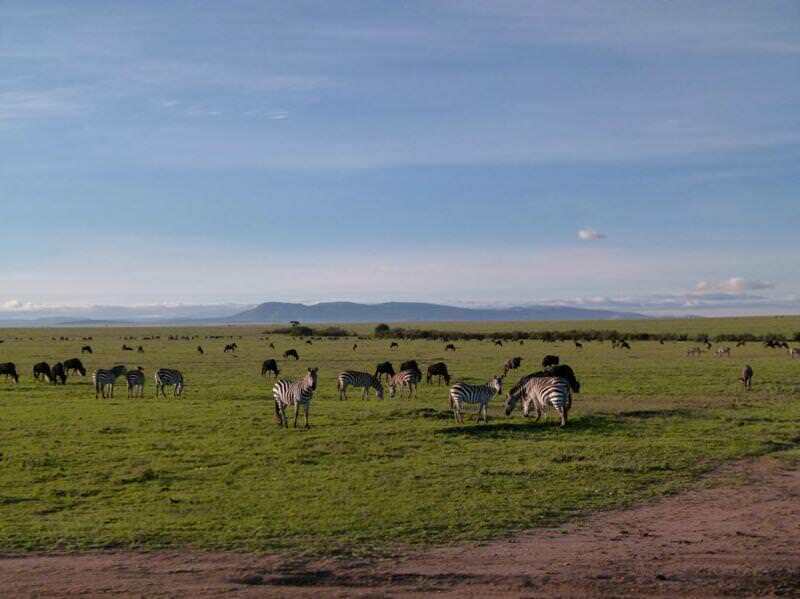 The enormous, impossibly blue sky was so stretched out over the horizon that it put the sky above the prairies of Canada to shame, and amongst all this were hundreds of thousands of grazing wildebeest, zebra, kudu, gazelle, impala, and just about every other antelope you could imagine. We had about 2 hours of sunlight before the great cliffs of the Rift Valley which surrounded us turned a golden orange as the sky turned pink and the animals came out in the relief from the heat of day. 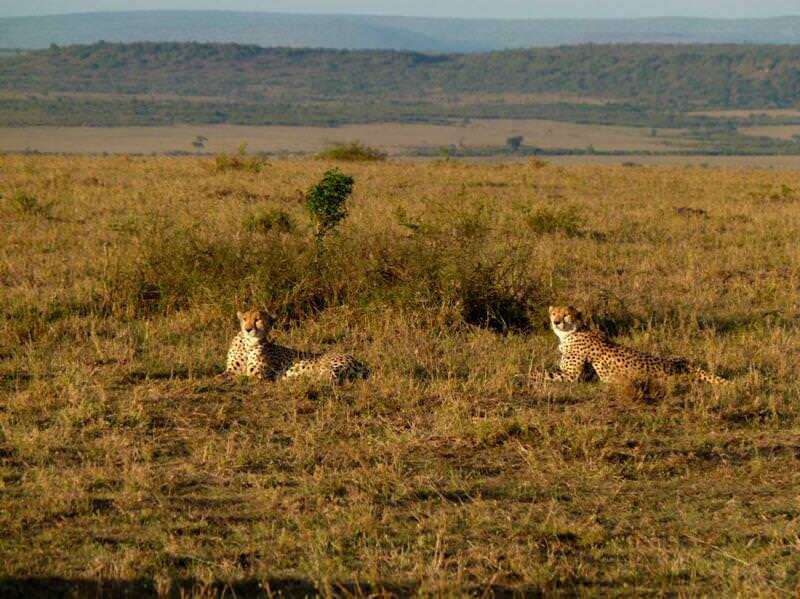 In that first 2 hours of game driving we spotted 2 cheetah, huge herds of elephants, 2 prides of lions with cubs and plenty of giraffes wandering around with their typical slow, confident saunter. 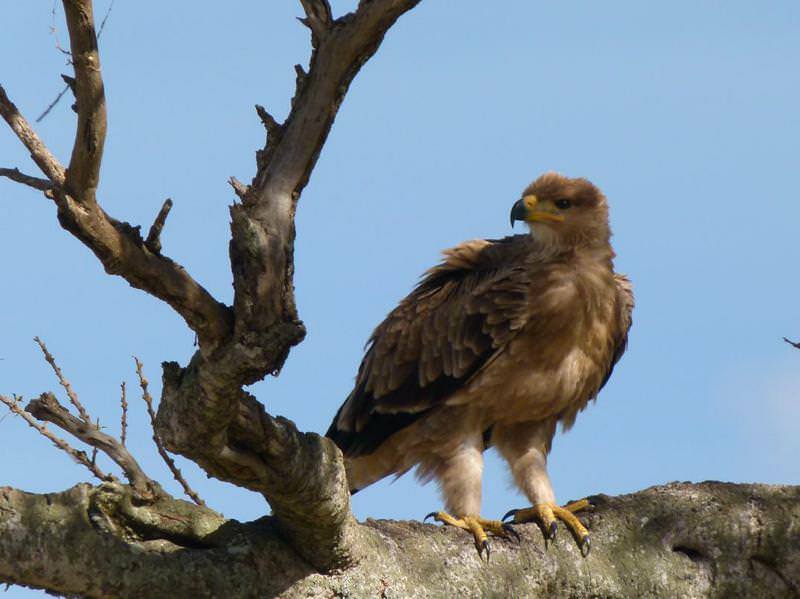 By the time we arrived at our camp we were already buzzing with a familiar safari excitement. The campsite was exactly as we had expected, basic tents with thin mattresses, a nice camp fire and lounging area, a kitchen, dining room, and (surprisingly) hot showers. 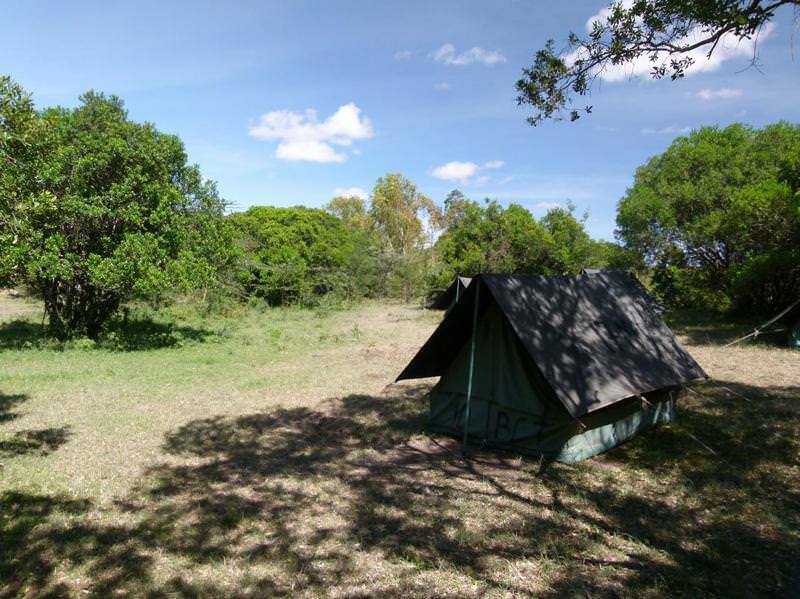 After considerable research, we booked our budget safari through Best Camping Safaris in Nairobi. The reason we booked with them was because the Manager, Imraan, seemed like a trustworthy guy (and lived in Calgary for 10 years) and Best Camping Safaris (Kenya) was the only safari company which seemed to have honest reviews on Trip Advisor, not just self-made acclamations by safari operators themselves like many others had. 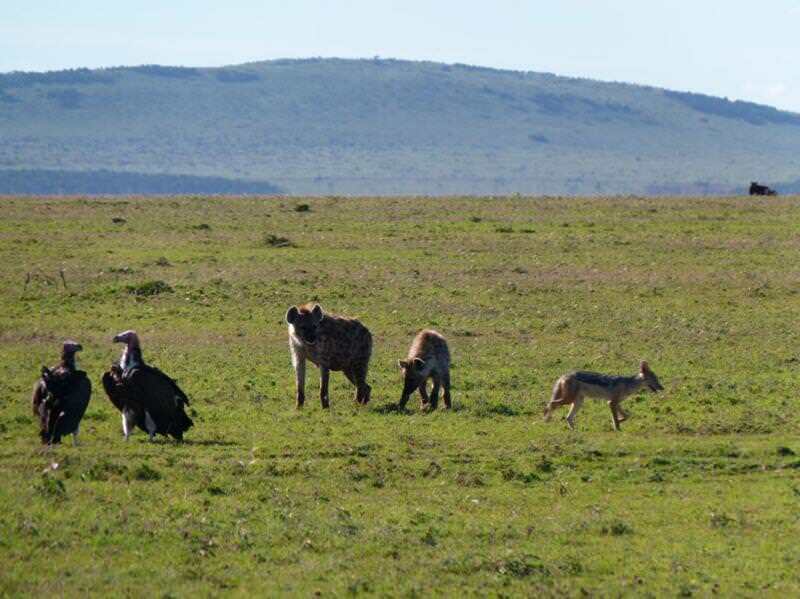 There were a few honest reviews explaining that the food was ok, the beds were thin, but the service and game drives were excellent. It was these, effectively critical reviews which set our standard, and gave us an idea for how the safari would be. And they were basically spot on. The beds were thin but comfortable, the food was okay, but our crew of cooks, our guide, and watchmen were superb. 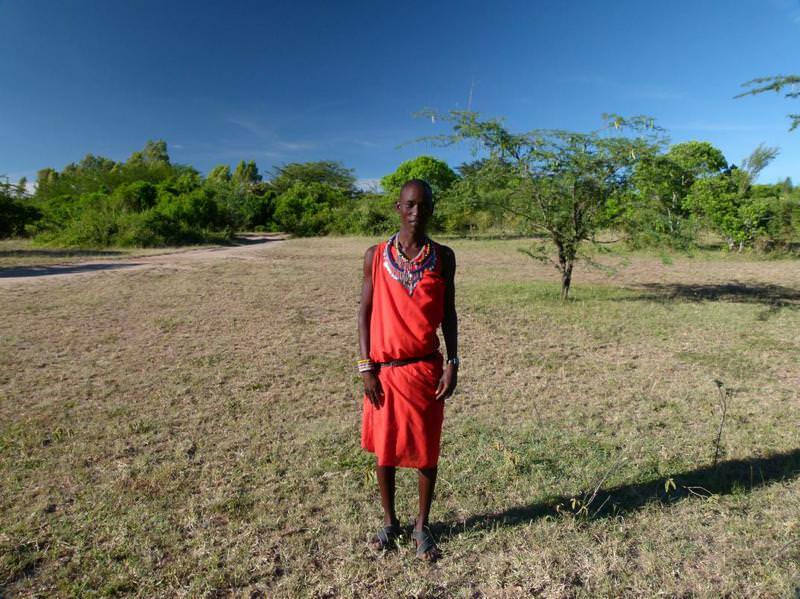 There were two Masai Warriors who watched over the campsite every night. 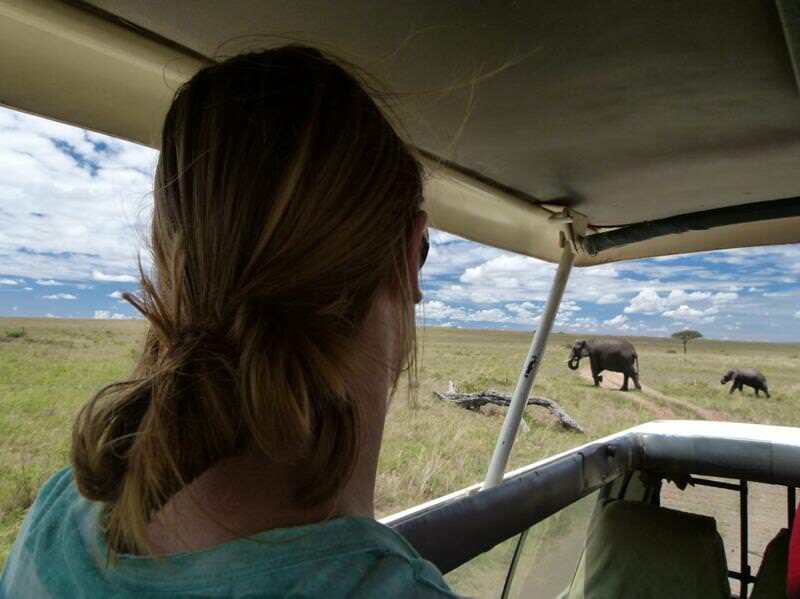 As budget backpackers, this was a perfect safari for us. They even have a more luxurious style of safari as well if that’s what you’re into. That first night, as we fell asleep to the sound of hyenas and jackals cackling in the great valley, our Masai Warriors kept watch. 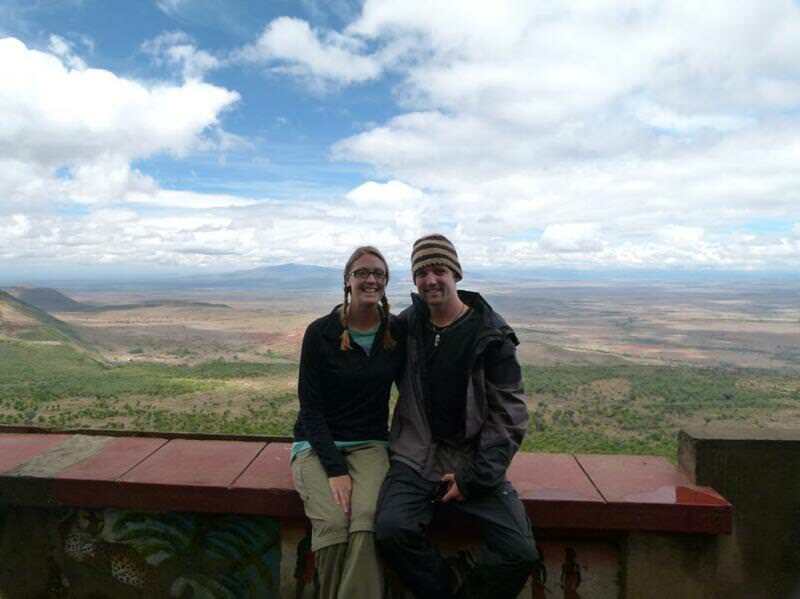 Our Safari was 4 nights total, 3 nights spent in tents in the Masai Mara Game Reserve, and 1 night in a hotel outside of Lake Nakuru National Park. 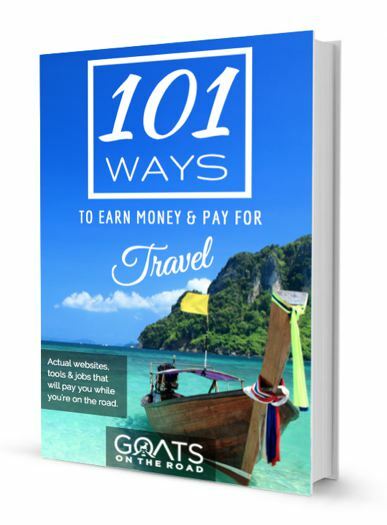 For the curious travellers reading this blog, it cost $1400 for 2 of us, including food, guides, accommodation, some water, soft drinks and park fees. Although that would normally be way out of our budget, a proper safari in one of Africa’s biggest and best parks was an essential element of our visit to the continent… and we didn’t regret it for a minute. Our safari vehicle was just a van with a pop-up roof where we could stand up and have a full 360 degree view of the park. 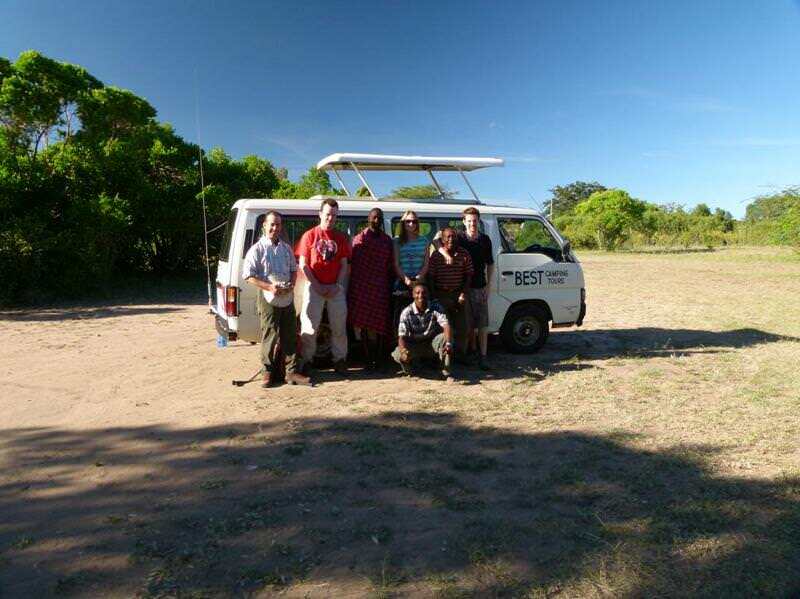 It could hold up to 8 passengers but we were extremely lucky to only have two other guys on our safari with us, Marcus and Patrick. In fact, it was only us four in the entire campsite as well. 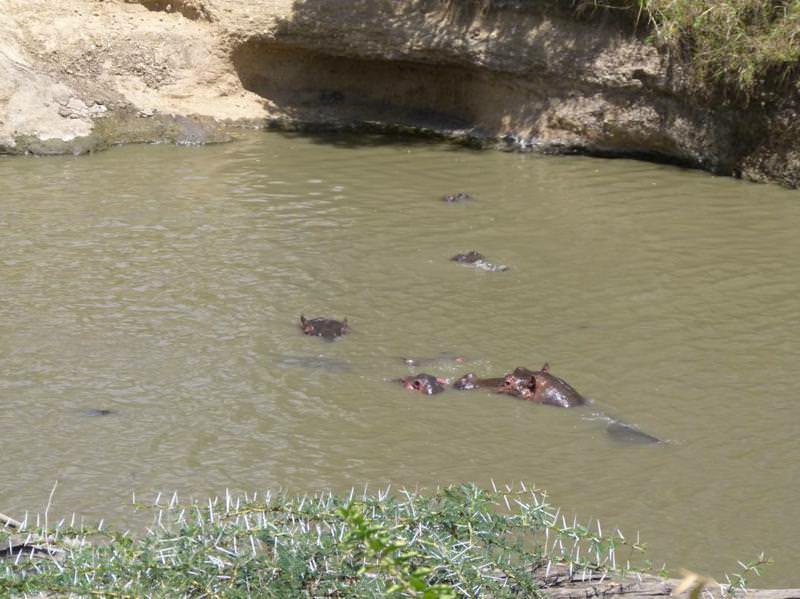 We had three game drives per day, each one lasting between 2 and 3 hours. One in the morning, mid-day, and late afternoon, the former and latter being the best for spotting big cats, hyenas and the most interesting of the parks game. Every time we stepped into the van and put our heads out of the roof with the anticipation of spotting something new, we weren’t disappointed. Every drive offered something we had never seen before. 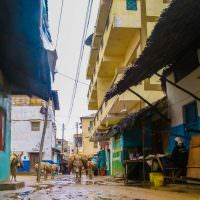 It would be impossible to explain in a blog the feeling we had when our van crawled past a pride of lions or through a herd of giant elephants. How could a person put into words the surreal pink, blue and orange colors that the massive sky projects above the plains as the sun creeps below the towering cliffs of the Rift Valley? 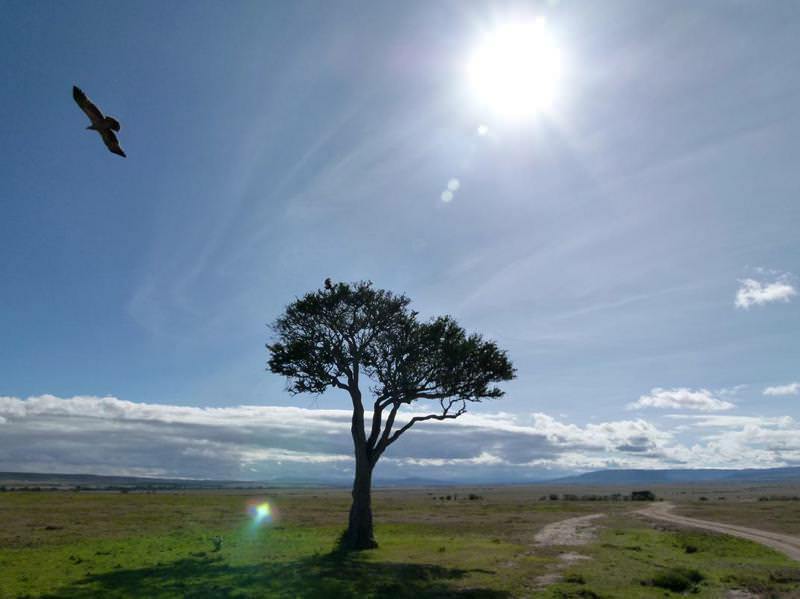 The entire time we spent in the Masai Mara was like a dream, complete with all the African life and death dramas of a National Geographic special. The reality of being there, however, brought in smells and sounds with the breeze that a camera and a blog could never capture. I could write page after page to list the great things we saw in those four days but I’ll save you guys the reading. 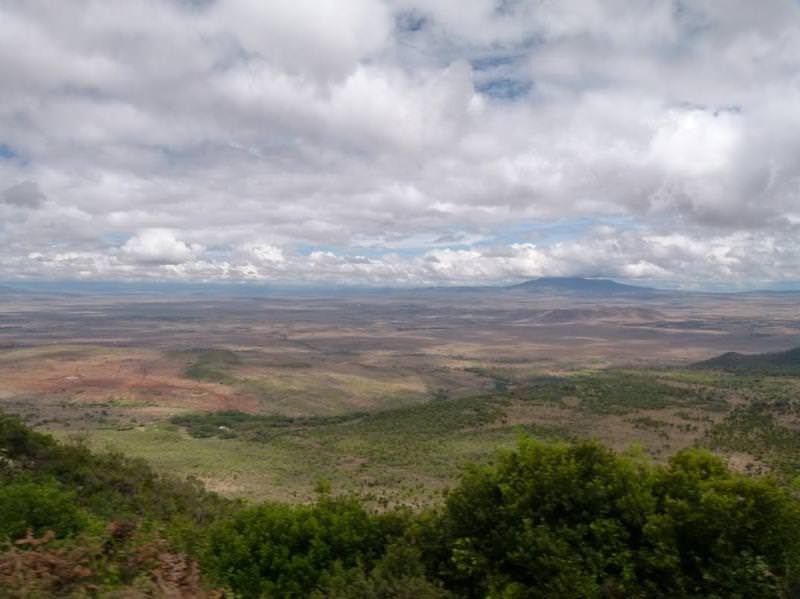 There were a few points on our safari drives that stand out above all and are worth mentioning. 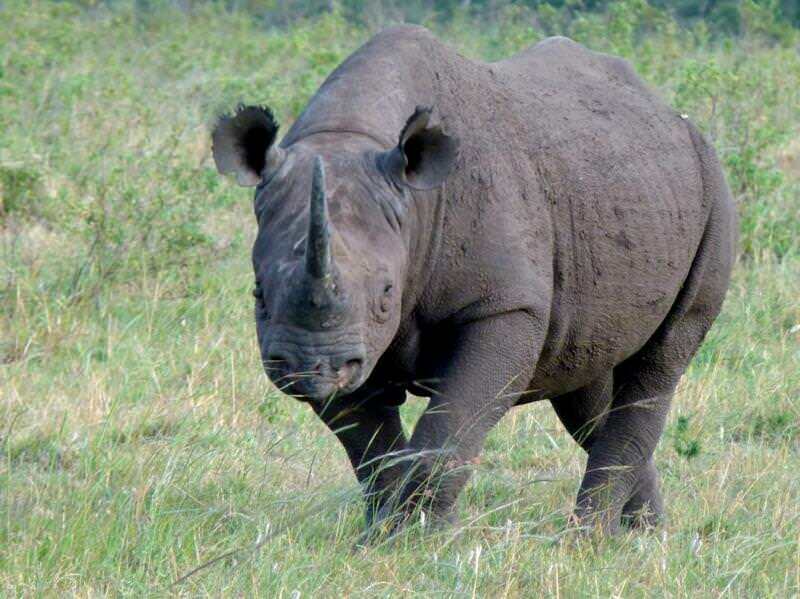 We saw our first ever Black Rhino (the most endangered African Rhino) on day 2 and he came within 10 feet of the vehicle. That same day during our mid-day game drive we stopped and turned off the van and sat for 15 or 20 minutes as a huge herd of elephants slowly grazed and walked right past us. 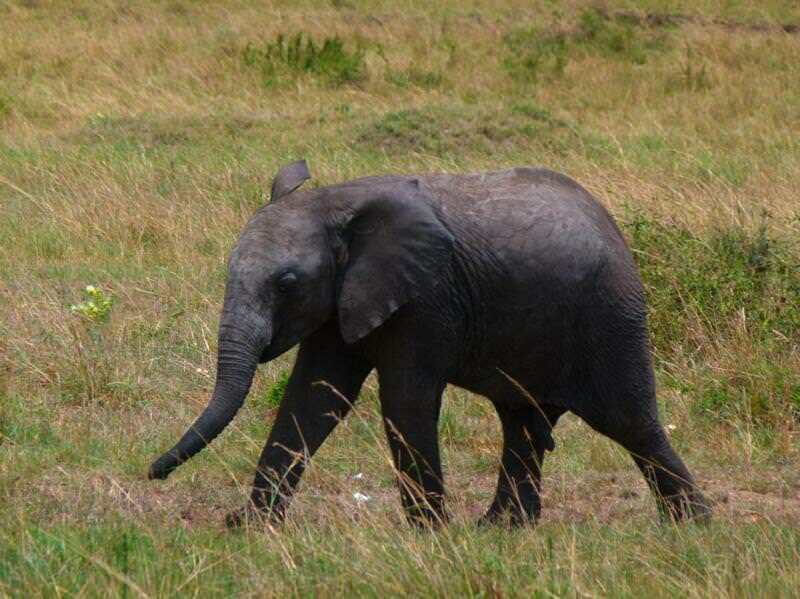 They were keeping a close eye on us and never letting the baby elephants stray too far, slightly weary of our presence. 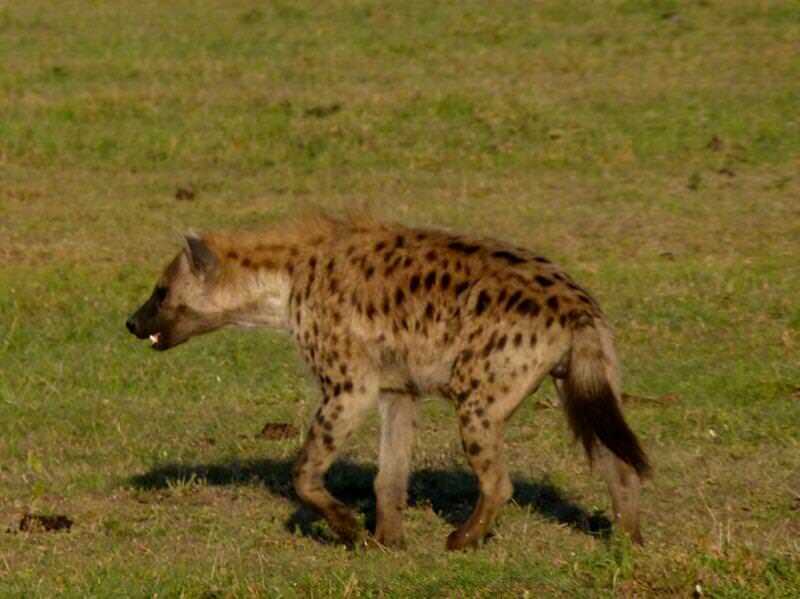 On day 3 we saw our first hyenas, although we had heard them a lot at night. Seeing as we had seen dozens of lions every day, the king of the jungle lost the excitement to be a highlight by himself, until the afternoon drive on day 3 when we came over a hill and saw an entire pride of lions feasting on a full-grown giraffe that they had taken down a day or so before! The smell was so pungent it was hard to breath without gagging and it was almost impossible to imagine how the cats could take something so huge to the ground. 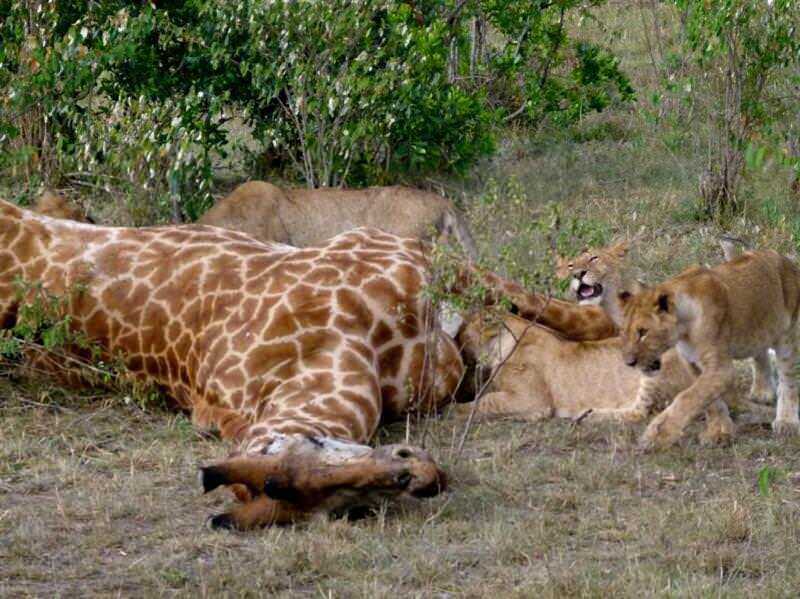 The males and full-grown female lions were sleeping, stuffed full, about 10 meters away from the carcass, lazily surrounding it and guarding the kill while the cubs and adolescent males practiced tearing and pulling at the decaying flesh with their newly formed teeth and claws. 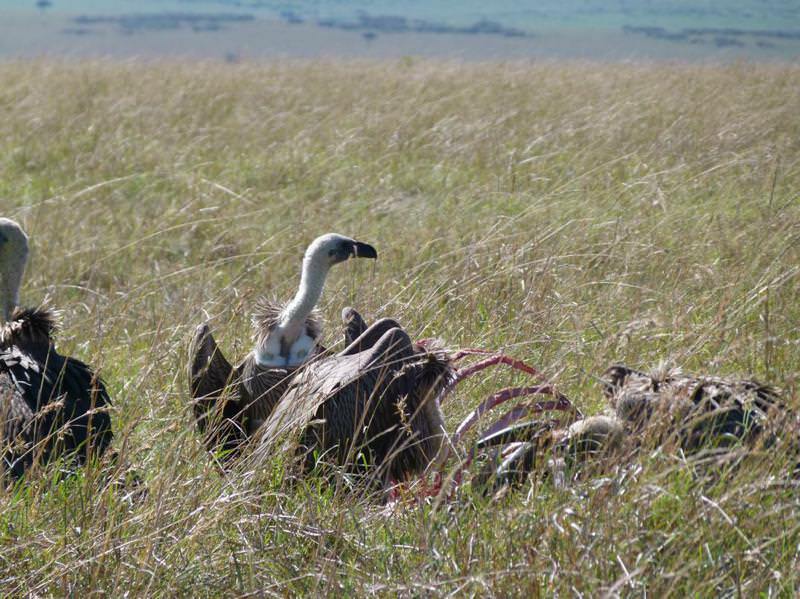 There was more playing than eating but as our guide John explained, they learn a lot from watching their parents when making a kill. Even though every day, and every drive was so amazing, somehow the best was still saved for last. 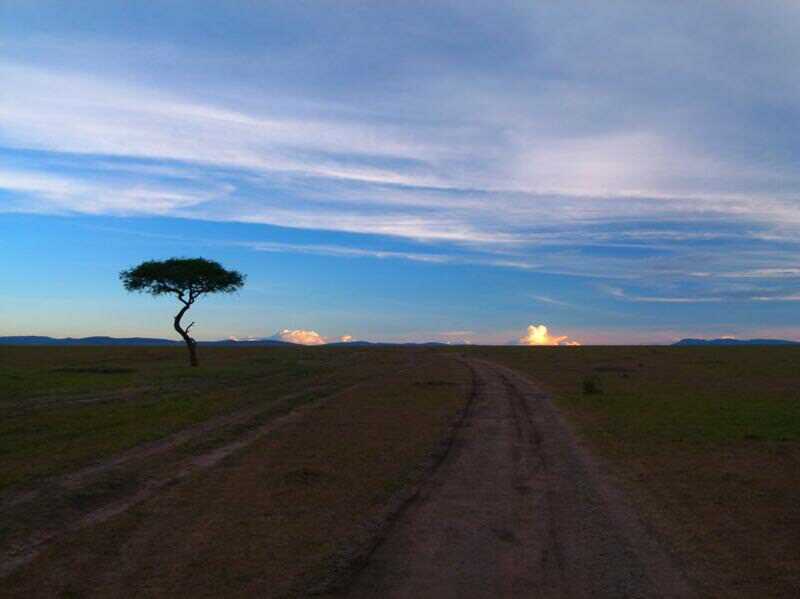 On the final game drive in the Masai Mara, on the afternoon of day 4, John took us to the middle of nowhere. 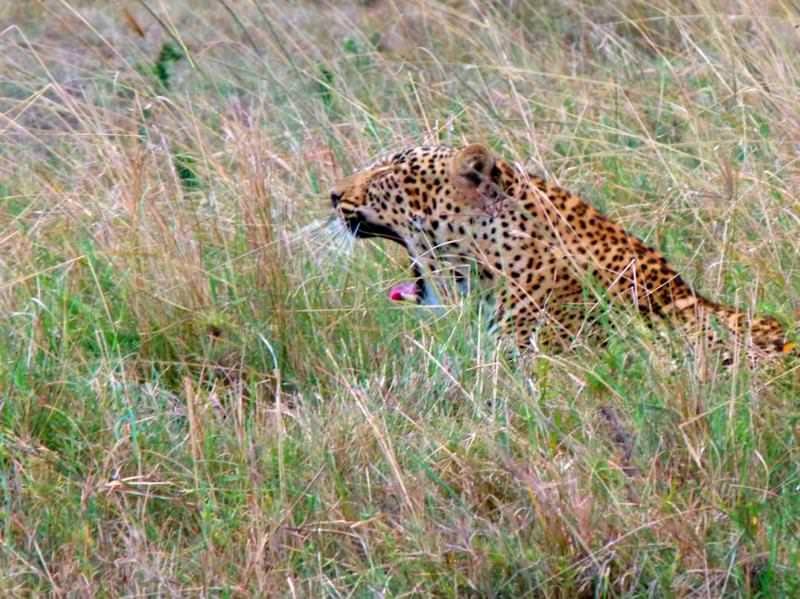 For the three days before we had been bugging him to find us a leopard, the most elusive of the African game in the Mara. We hadn’t been lucky enough yet, and we had already expected not to see one because they are very hard to spot. They only usually come out when the sun has set and they don’t like to give tourists the privilege of parking close and taking lots of pictures. So as our van drove further and further into the empty savanna, and the grazing antelopes became more scarce, John explained that we were entering leopard territory. No radio calls had been made about a leopard spotting so John said we were unlucky and probably weren’t going to see one. There were a few other jeeps patrolling the area and every time John stopped and talked to them they would shrug and say something in a disappointed Swahili tone. John decided to do one more swing around the treeline before giving up. We were slowly creeping through the grass when Marcus yelled from behind me “THERE! !” and John slammed on the brakes. Immediately my heart started pounding and all I was thinking was “this better not be a zebra or something”, but sure enough, just 3 meters from the van, laying almost totally camouflaged in the grass, was a perfect specimen of a male leopard. 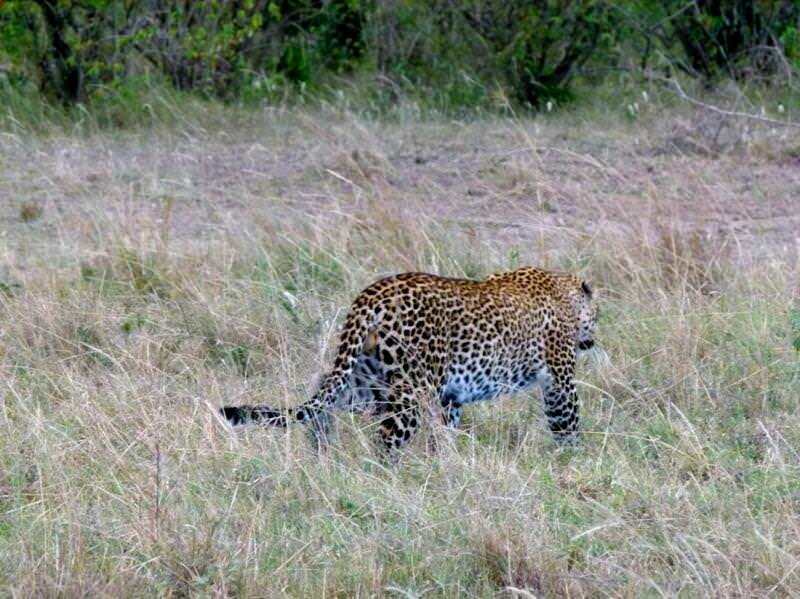 Not only had we spotted the most beautiful and elusive of Africa’s cats, but we were the only car around for miles. John pulled up close and turned off the engine and we just watched as the gorgeous cat played in the long grass. He did everything we could have hoped for. He rolled around, swatted at flies, yawned, got up and walked a bit, and laid down again. Just enough time for us to get about a thousand photos and a few videos. Then, after John made the call on the radio and other jeeps pulled up, the big, muscular male cat hungout for a few more minutes before retreating slowly and proudly into the jungle as if he was saying “okay that’s enough, nothing more to see here”. 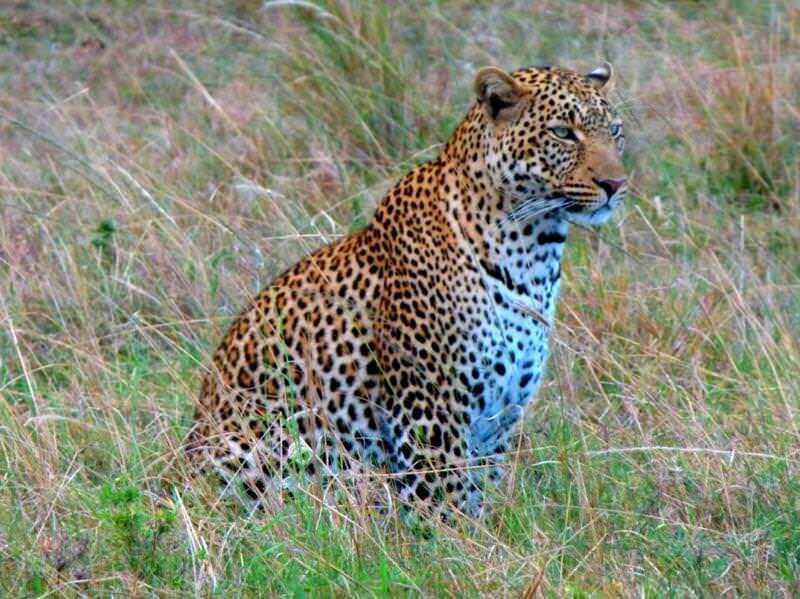 The leopard is the star celebrity of anyone’s African safari and as he left the great stage of the Masai Mara, we all had the feeling he knows where he stands in the hearts of his fans. 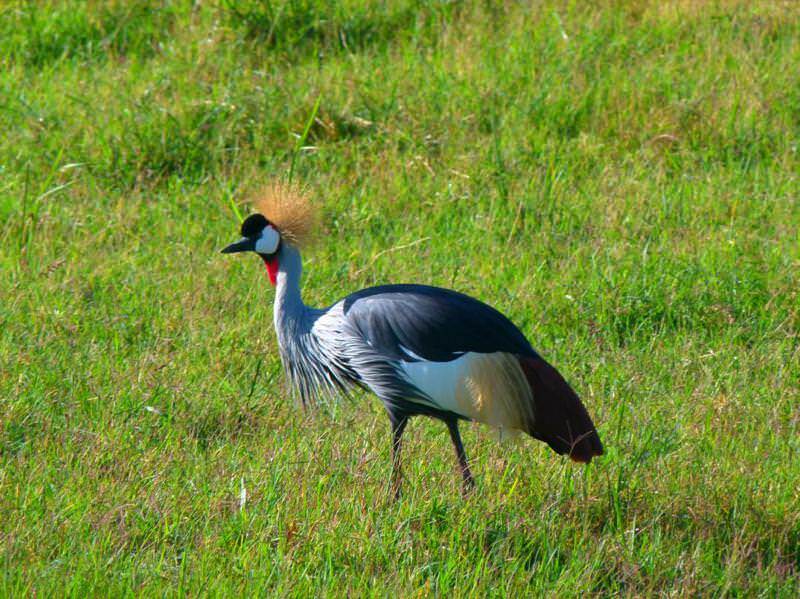 He only ever shows up long enough for a quick sighting and at most a few photos, then usually just disappears back into Africa. 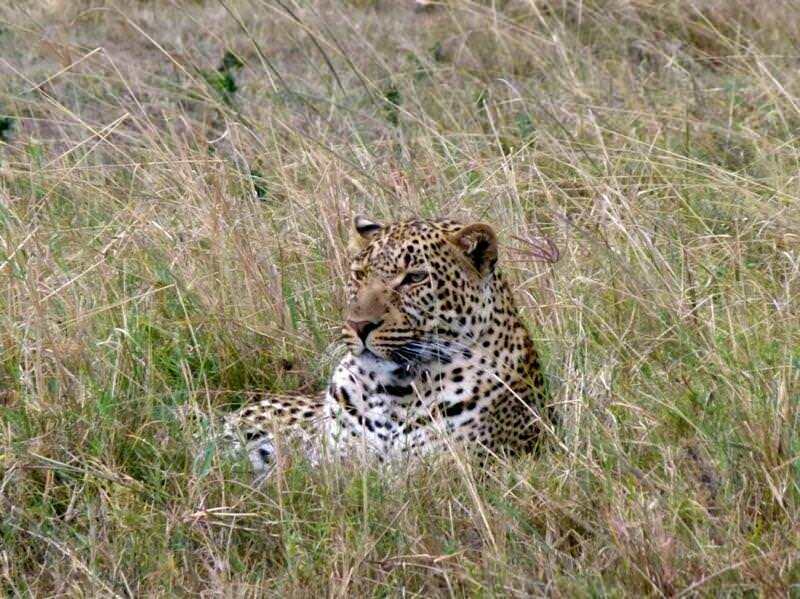 The beauty of his spots is matched only by the allure of his demeanor and anyone who sees him is awed by his presence. The whole way back to camp we were talking about how amazing our leopard spotting was, but Africa had one more treat in store for us. 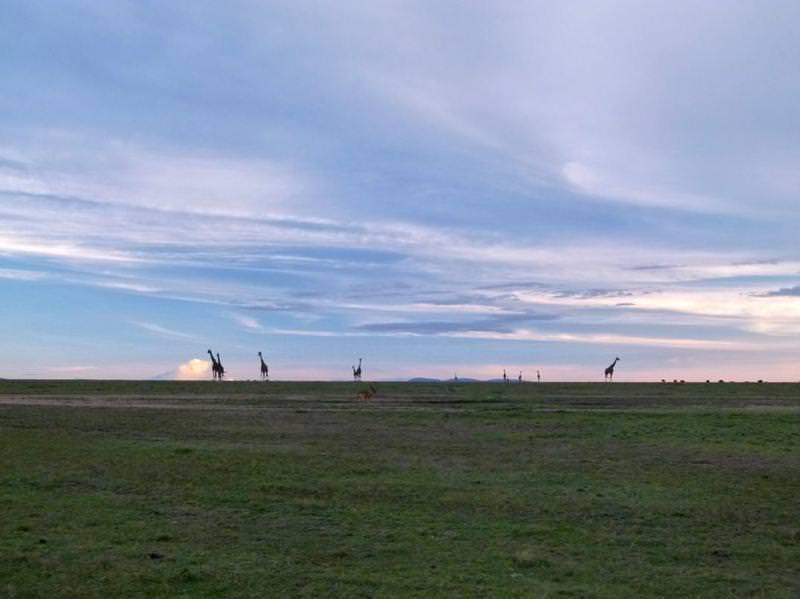 As we neared our camp we saw dozens of giraffes slowly walking, their long necks like construction cranes on the far horizon. We told John to turn off the van and we just sat watching in silence as 10, then 20, then 30 giraffes appeared across the grassy panorama. They slowly walked past us, some coming as close as 5 meters, all in a slow sad-looking procession. We joked that they were walking in a funeral ceremony for their friend that the lions had taken down the day before, but their effortless, un-rushed stroll did seem to have some kind of deep meaning. It felt like we were witnessing something not seen often and John even said he had never seen so many together like that. 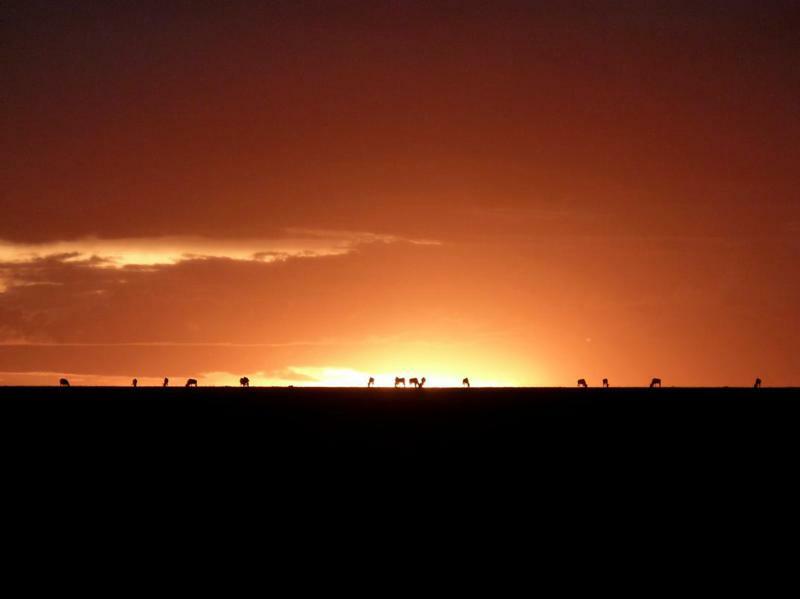 It was a great ending to a perfect day, and a perfect 4 day safari trip through the Masai Mara. 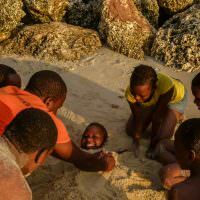 Yet another experience that only the great mother of all continents can offer, and although Africa can be hard to travel some times, it’s these moments that make it all worth while. 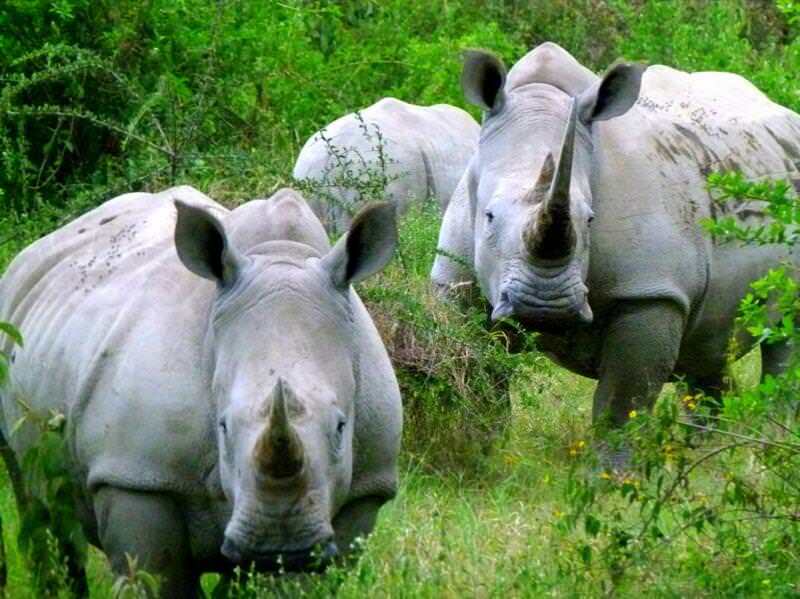 ” The Big 5″ Is an old hunting term that pertains to the 5 most dangerous animals in Africa to hunt. 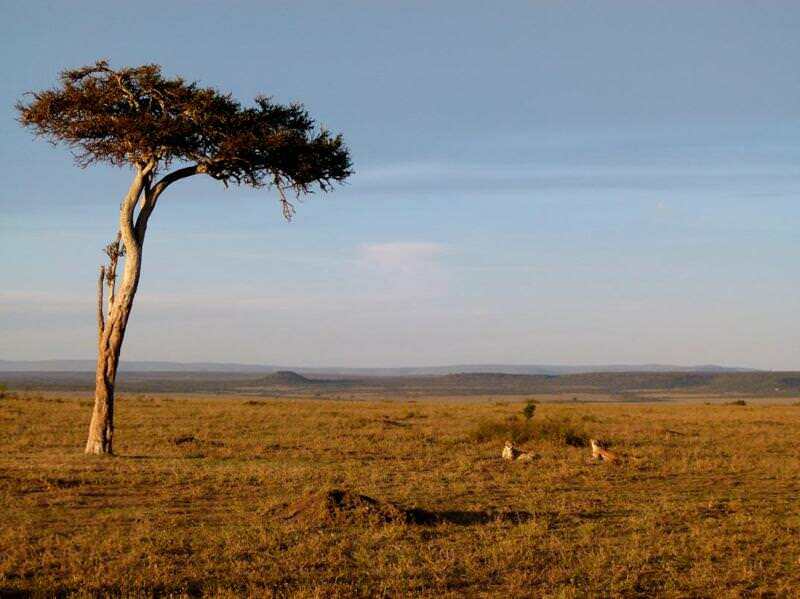 This term has been adapted as a slogan for safaris throughout the continent. It is technically: Lion, Leopard, Elephant, Rhino, and Buffalo. “Safari” Is actually a Swahili term which literally means “Journey”. Bring extra water on safari. 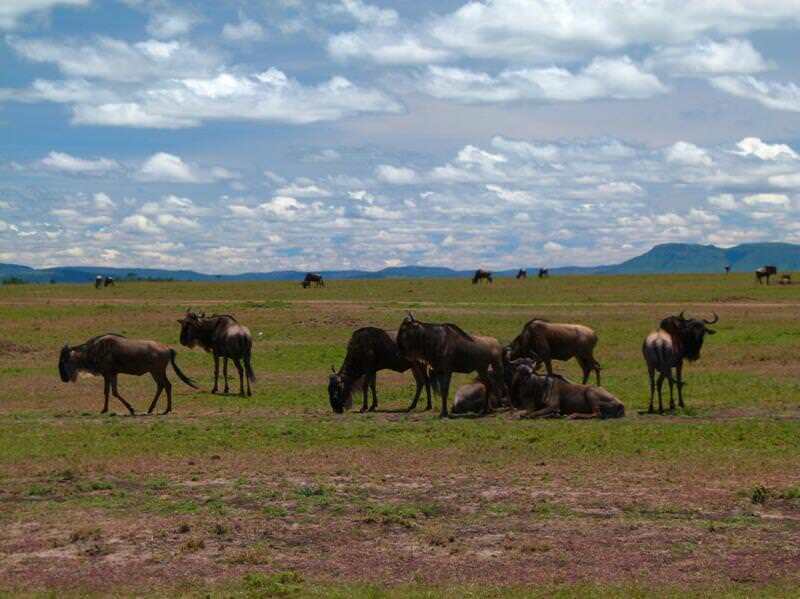 The wildebeest migration is not a science and can be MONTHS off schedule, if you arrive late then they are interspersed on the plains. Too early and they’re not there. Just right and you’re VERY lucky. Do not allow your guide to break the rules of the park. Driving off the path is disruptive to the ecosystem so ream him out if he strays from it. 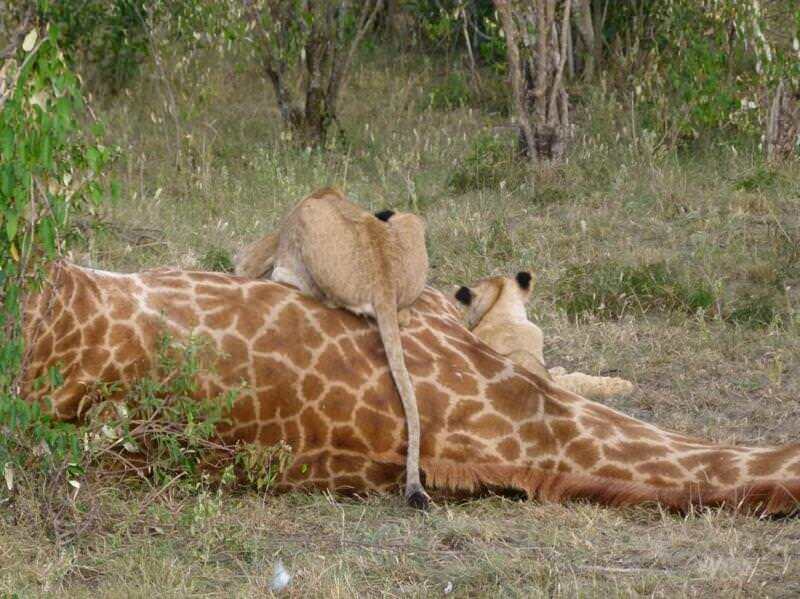 Use your safari company as a taxi. 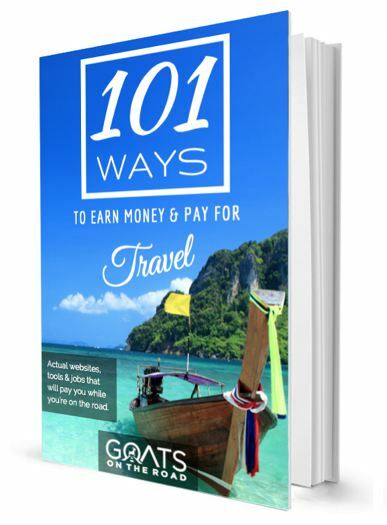 They should be willing to pick you up at the airport or bus station and drive you to your hotel. They will also pick you up on the day of the safari. I wish you had said a bit more about the camping aspect and the campsite itself. however great article, thanks for sharing. Thanks for writing the interesting article. During which month did you visit ? 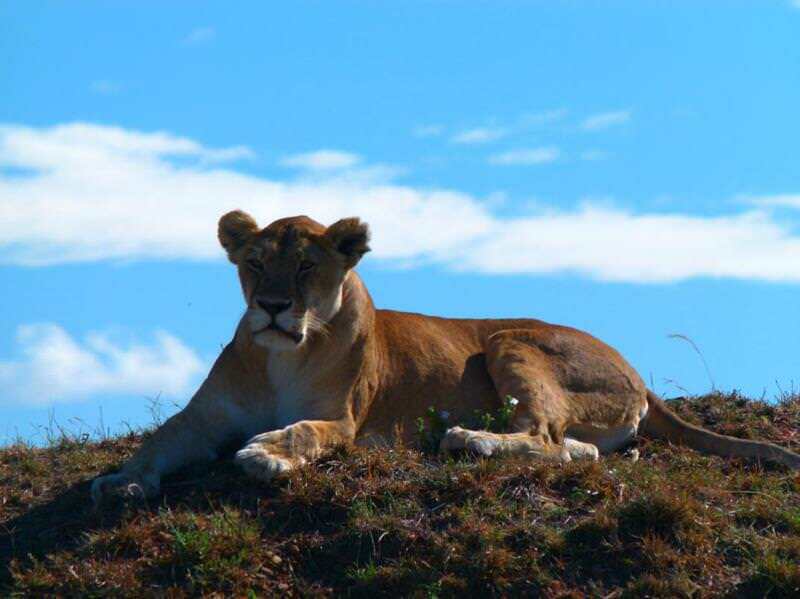 We were in the Masai Mara in November. I am trying to check out the same trip but I go to Best Camping Safaris and seems that the website has an error… Could you please send me an email address I could contact? Thanx! Wow wow wow! 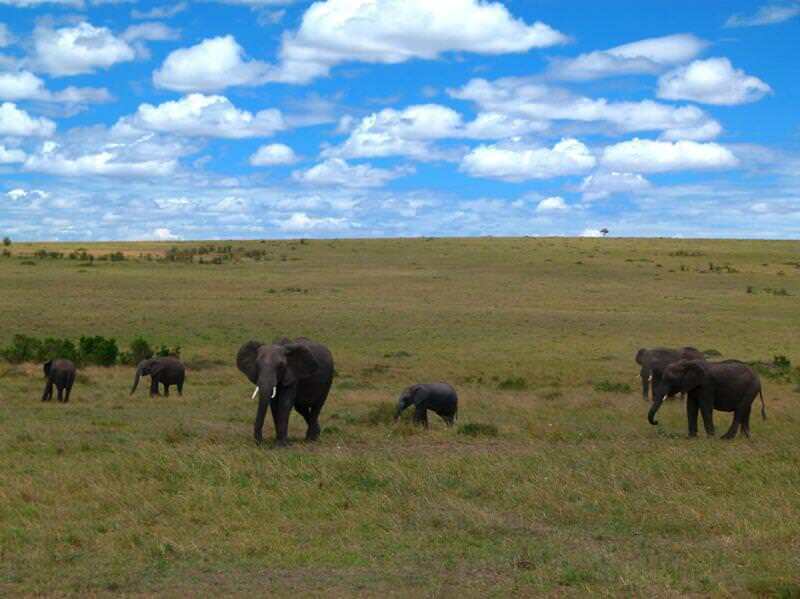 I’m hoping to go to Kenya next year during the great migration (hopefully) and this makes me so excited. 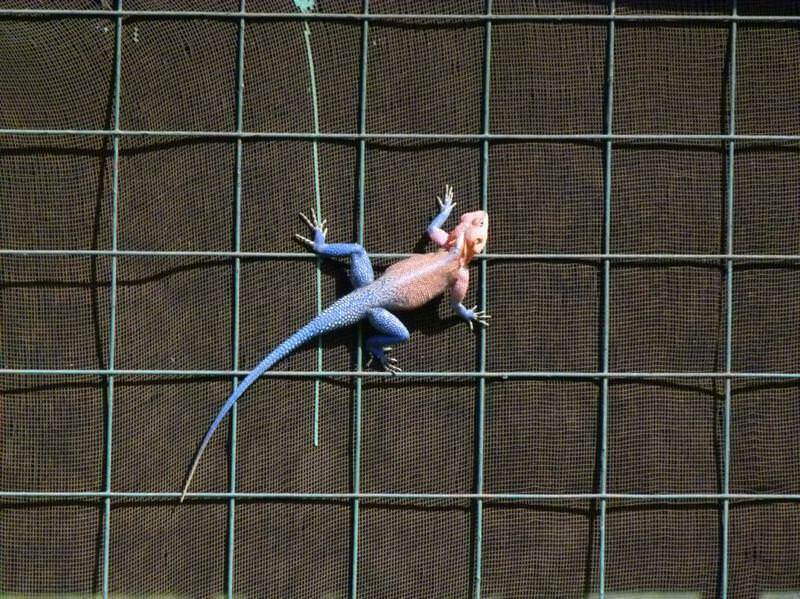 Great pictures…..so awesome you got to see all the animals you wanted. 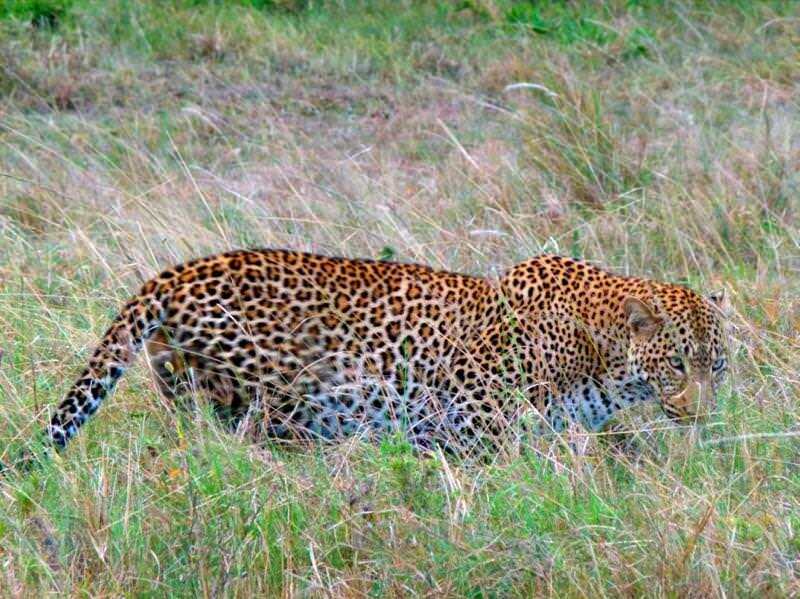 Its such a pity that we have never been able to see a leopard in Africa! Totally envy you on that one! 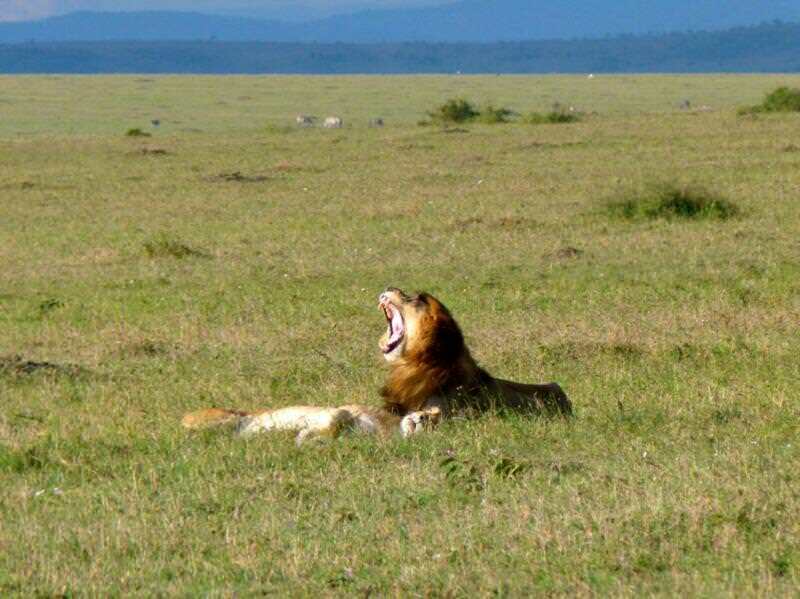 I love the whole story, thanks for your great review on Masai Mara National Reserve. 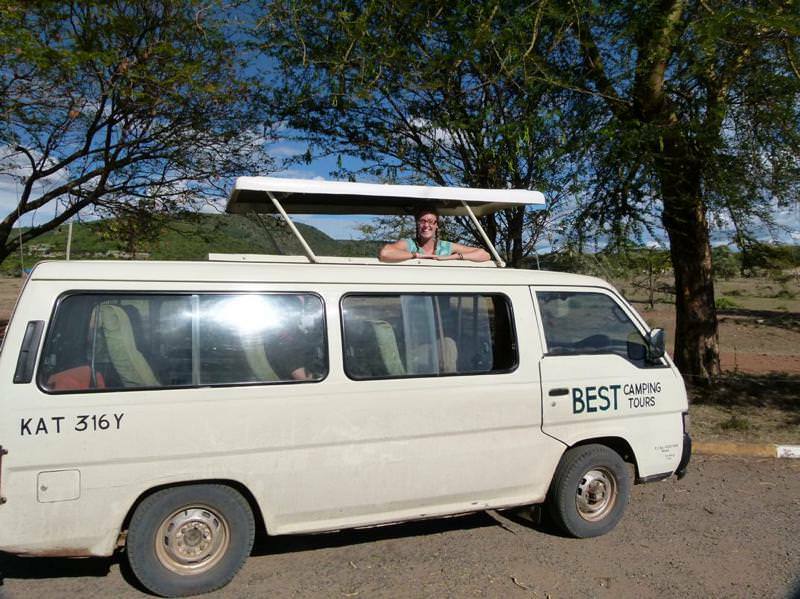 I also recommend Best Camping Tours and Safaris for a great experience.